Chambers was born in Springfield, Ohio, on July 11, 1970 to John William Eugene Chambers II and wife Pamela Sue Willman, who were both Deputy Sheriffs. Chambers was brought up in Springfield and growing up he aspired to be a dentist. He has a fraternal twin brother, Jason; one older brother, John William Eugene III (Chip); and two older sisters, Mia and Susan. Chambers and his twin brother were hospitalized often as children due to frequent bouts of pneumonia. He attended Southeastern High School in South Charleston, Ohio, and later moved to New York, where he studied for four years at HB Studio and Ron Stetson Studios. Chambers was discovered by a modelling scout on the Metro and went on to star in ad campaigns for Calvin Klein's fragrance range. He worked throughout Europe, Japan, and the United States for Calvin Klein, Armani, and Dolce & Gabbana. After deciding on an acting career, he moved to New York City in the early 1990s, where he studied at the HB Studio. Studios and Ron Stetson Studios for four years. His first major acting role came in the music video "Ants Marching" by Dave Matthews Band in 1995. He went on to land a few television roles, including recurring role in soap opera Another World as Nicholas Hudson, and New York Undercover. In 1998, he was cast as series regular in the short-lived CBS primetime soap opera Four Corners. Chambers also appeared in several television movies, such as Harvest of Fire, Rose Hill, and Seasons of Love. Chambers starred in several movies, notably Liberty Heights (1999, as Trey, alongside Adrien Brody),Wedding Planner (2001, as Massimo, alongside Jennifer Lopez), The Musketeer (2001), Southern Belles (2005), The Zodiac (2005), and the HBO original movie Hysterical Blindness (2002). In 2003, Chambers was cast as one of the leads in the CBS crime drama Cold Case but left after appearing in only four episodes. In August 2004, Chambers was cast as surgical intern Alex Karev in Shonda Rhimes's medical drama series Grey's Anatomy, opposite Ellen Pompeo, Sandra Oh, Katherine Heigl, and T. R. Knight. In 2006, along with other cast members, he was awarded a Screen Actors Guild Award for Outstanding Performance by an Ensemble in a Drama Series. In 2009, he also guest-starred on the Grey's Anatomy spin-off, Private Practice, for the Grey's Anatomy/Private Practice crossover event. In 1993, he married Keisha ..., a former model agency booker. The two met while Chambers was working for ad campaigns for Calvin Klein and Keisha was working at a modeling agency. They have five children together, Isabella (b. December 1994), twins Maya and Kaila (b. June 1997), Eva (b. March 1999) and Jackson (b. January 2002). They have adopted two rescue dogs and own a beagle. Chambers is involved with the nonprofit Pentecostal Christian Church mission Dream Center of Los Angeles. In late January 2008, he revealed that he suffered from a biological sleep disorder, and had checked himself into Los Angeles's UCLA Medical Center to treat exhaustion after a period of only two hours of sleep each week. Chambers follows a healthy lifestyle and practices hot yoga. 1995 Another World Nicholas 'Nick' Hudson #1 Episode: "#1.7922"
1996 New York Undercover Officer Nick Caso Episode: "Unis"
1996 Swift Justice Rick Episode: "Stones"
2009 Private Practice Dr. Alex Karev Episode: "Ex-Life"
^ a b "Justin Willman Chambers". Moose Roots U.S. Census Records. Retrieved May 15, 2016. 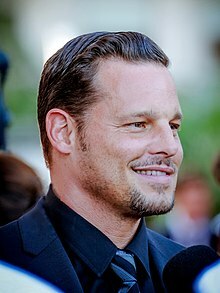 ^ Justin Chambers Biography (1970–). Filmreference.com. Retrieved on December 28, 2012. ^ "Justin Chambers on ellen". ^ "Justin Chambers". TV.com. Retrieved May 21, 2016. 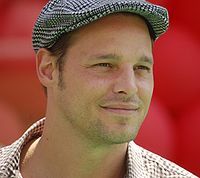 ^ a b "Justin Chambers Biography". Buddytv.com. Retrieved October 13, 2013. ^ a b "Justin Chambers Biography". Tvguide.com. November 28, 2012. Retrieved October 13, 2013. ^ "Chambers takes 'Anatomy,' cops lead in 'Belles'. (news)(Brief Article) | HighBeam Business: Arrive Prepared". Business.highbeam.com. August 19, 2004. Retrieved October 13, 2013. ^ "Justin Chambers Credits". Tvguide.com. November 28, 2012. Retrieved October 13, 2013. ^ a b Friedman, Molly (May 31, 2015). "Who Is Justin Chambers's Wife? 5 Things to Know About Keisha Chambers". Wetpaint. Retrieved May 21, 2016. ^ a b c "Justin Chambers: 25 Things You Don't Know About Me". US Magazine. April 11, 2014. Retrieved May 21, 2016. ^ "Justin Chambers Opens Up About Sleep Disorder". People. March 27, 2008. Retrieved May 12, 2016. 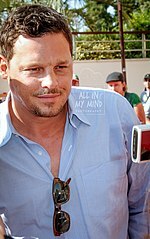 Wikimedia Commons has media related to Justin Chambers. This page was last edited on 20 April 2019, at 20:48 (UTC).